Andre Ayew and Gylfi Sigurdsson have scored 15 of Swansea's 24 goal this season. 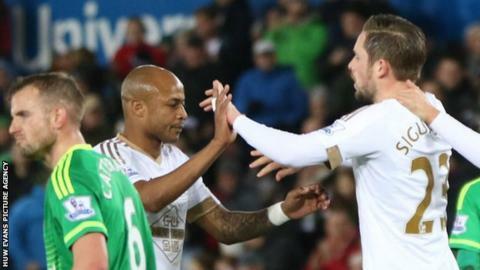 Swansea City are too reliant on Andre Ayew and Gylfi Sigurdsson for goals, according to coach Alan Curtis. Top-scorer Ayew and Sigurdsson have contributed eight and seven goals to the Swans' tally of 24, the joint-second lowest in the Premier League. Swansea signed striker Alberto Paloschi in January, though the Italian has yet to score for his new club. "We've lacked somebody since Wilfried [Bony] has gone," said Curtis, of the striker who departed in January 2015. Swansea signed Alberto Paloschi in the January transfer window in attempt to find more goals. "We brought Alberto in to score goals but the responsibility has to lie with the team," said Curtis. "Alberto wasn't brought in to be the main man but to make a contribution. "I think we're too reliant on Andre and Gylfi to get our goals, and it needs to be spread out." Swansea visit second-placed Tottenham on Sunday, taking on a team second in the Premier League scoring charts with 47 and who have conceded only 20, fewer than any other side in the division. By contrast, the Swans hover just three points above the relegation zone in 16th place. Spurs face Fiorentina in the second leg of their Europa League tie on Thursday and are just two points behind the Premier League's surprising leaders, Leicester, with 12 games left in the league season. "I think they've [Tottenham] done exceptionally well," said Curtis. "They've got a great opportunity to win the league this year and they're still in the Europa League. "I don't see any reason why they can't [win the league]. They've shown this year they can go all the way." Swansea have a fully-fit squad for their trip to White Hart Lane, and there could be scope for changes following a 1-0 home defeat to Southampton in their last outing. Winger Jefferson Montero is among the players hoping for a recall, having drastically fallen out of favour. After a sparkling start to the season, the Ecuadorian has not started a league game since December and was left out of the match-day squad to face Southampton, he has featured only once in the Premier League this year. "Jeff's form mirrors the form of us as a first team," said Curtis. "He started the season really well and just started falling away for whatever reason. "I think certainly Jeff has suffered from us switching to this diamond system. "He's an out-and-out winger and I think, because of that, he hasn't had the game-time." Asked if Montero and other players to have lost their places, such as striker Bafetimbi Gomis, could force themselves back into first-team contention, Curtis said: "Absolutely." "For Jeff and Bafetimbi, the opportunity will always be there for them."